As a gift to you, Domino has dressed up in an actual dress this week! 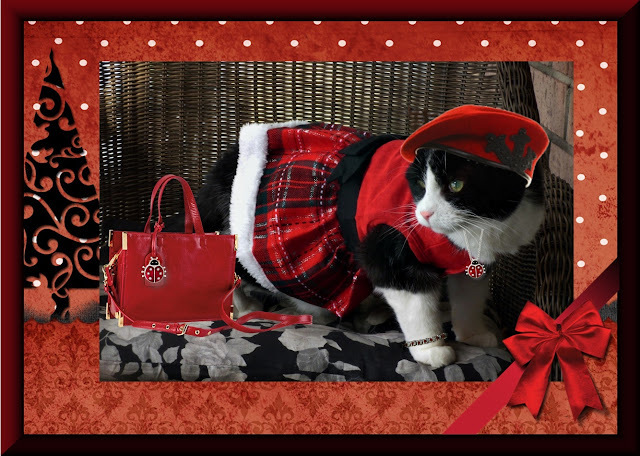 She is all decked out in her new red and black tartan dress with white fur trim on the bottom and black sash at the waist. Her red wool beret with black trim and embellishment is a supurrb complement to her festive frock. Domino is wearing a silver necklace with a red and black ladybug pendant. Although not typically seasonal for this time of year, it coordinates perfectly with the outfit, as does her red leather bag with ladybug accessory. She's also added a silver bracelet studded with red stones as the final touch. She's definitely a Calendar Girl for December even if she's not in an actual calendar! 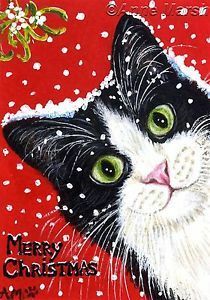 "An' a Happy Mew Year!" says Domino. You are such a classy gal sweet Domino!